Spotlight is an event, started by me, with a aim to learn more and more dishes we can make with one ingredient or with one subject. Blogging is such a wonderful medium from which we can learn healthy, delicious as well as unique dishes from every regions of India, which is so versatile and even cuisines from other countries around the World. Each month Spotlight will choose one theme for the event and the time frame will be from 15th of that month till next month's 15th. "Spotlight" will be hosted by me or my sister, Chandrani of Cuisine Delights. Lovely event. I send my entry soon. Happy hosting Indrani,will send my entries..
1st time here.following u from now on wards.. Happy hosting !!! will send my entry soon.. Happy to send my entry and have also taken the liberty of quoting you, I liked your remark about the nutritional peaks of seasonal vegetables, exactly my Ma's sentiment. Hope I have followed all the rules. can I send chili pickle to this? Nice event.. Have linked my first entry for the event.. Hoping to most more recipes.. I have just linked my first entry. Hope you'll like it. And thanks for following me.. Thanks, Akila and Sona for linking your recipes.. In my first entry I did not take notice of what others were doing and I made a silly error, you see I am a bit inexperienced about these things, instead of mentioning the name of the dish, I typed my name. Is there anyway I can rectify the error. If it is possible for you to rectify it the name of the dish (No: 3) is Stir Fried Fenugreek Leaves with Aubergine. Wonderful event enjoyed taking part in it, hope I have followed all the rules with respect to the archived entries. Indrani just added two recipes. thanks for hosting. Linked my entries :)..do drop in sometime by my space! Hi,first time here, nice event, linked in my entry, Pumpkin Pachadi..
Hi Indrani, I didnot get the result of your spotlight curries /gravies, guest hosted by Chandrani. If possible, please provide me the link. Thanks dear. Hi I am Janani.I have submitted my festival recipe link to the site.thanks for hosting such a lovely event glad to be in your circle. Hi..Im sajina...Just luved d events..i have posted in chandrani's valentine treat..
Chandrani where to put... in which category? plz let me inform...? 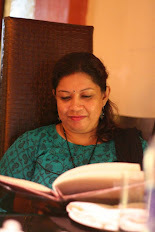 HI Indrani, very nice blog and am first time visiting this blog through Cuisine delight blog. Happy to post in your event. I would really appreciate if you would give me a chance to host your event in future if it is open.